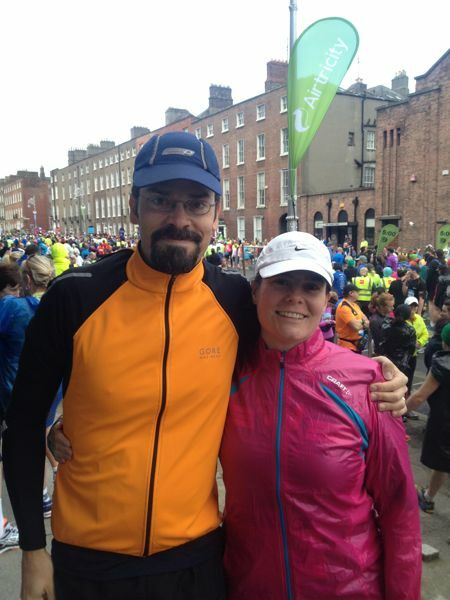 I ran the Dublin Marathon and, in the process, checked off one of my harebrained bucket list items. Some years ago, I decided that for my 40th birthday I wanted to run a full marathon, just so I could say I’d done it, and also to show that getting older doesn’t necessarily have to slow a body down. 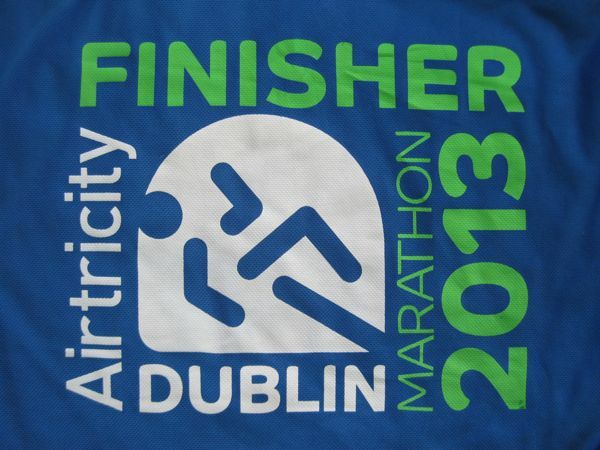 I don’t recall now why I chose the Dublin Marathon, except that it was in my birth month of October. I persevered thanks in large part to my dear Bugman, who suffered through all those long runs with me, and also to Dr. Rohrick at Care Chiropractic, who got me past some pain that I thought would knock me out of running altogether, and also to my friends who encouraged me every step of the way via social media and in person on the road. And nope, I won’t run another full marathon ever again, unless I am saving someone’s life or something. It was time-consuming and painful, and the half marathon distance is plenty challenging enough for me, thankyouverymuch. Got up and had some tea, buttered toast, and oatmeal for breakfast. Put on the clothing I had laid out the day before: long pants, technical short-sleeve t-shirt with race number affixed, the new thin rain jacket I’d purchased at the race expo, and my running cap. It was about 45 degrees Fahrenheit and expected to climb into the 50s, so I skipped the gloves. Because the most obvious route to the start area was through the race finish area, which was gated off, we detoured through an alley. 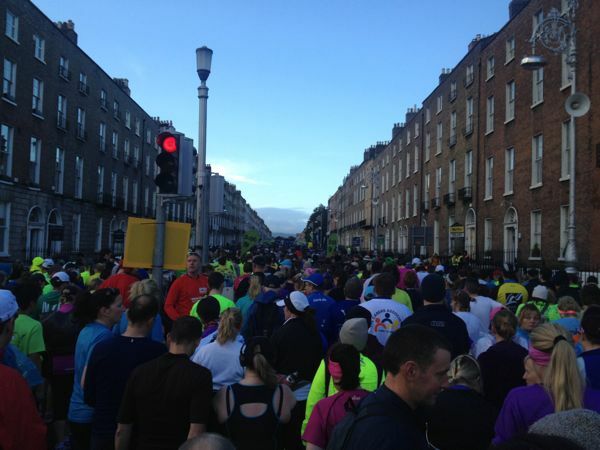 The start area was chaotic, as one would expect with a race of 14,600-plus people, plus well-wishers. We entered the official start area gate by showing our race numbers and proceeded to the bag drop-off area, which was divided by start wave. There were three wave start times: 9 a.m. for the fastest runners (orange race bibs), 9:10 a.m. for the next fastest runners (green bibs), and 9:20 a.m. for back-of-the-pack people like me (blue bibs). It was quite a process to get all those people organized and to the start line. The orange people were directed west around the block, to line up at the start line. The green people were directed onto a side street to the east, so they could move into place at the start line after the orange people had taken off. We blue people lined up a few blocks back, behind the street where the green people came in, and moved forward after the green people took off. The race program said we were to be in our designated start area by 8:30 a.m. That meant nearly an hour of waiting there on Fitzwilliam Street Lower in breezy 45-degree-Fahrenheit weather before our start time. Brrr! I really wish I had packed one of the sweatshirts Bugman purged from his closet for Goodwill. I could have put that on and then discarded it just before the race started. As it was, Bugman and I stood next to a building to get out of the wind as much as possible, huddled together to retain body heat, and shivered occasionally. All in all, though, we REALLY LUCKED OUT, as a massive storm just bypassed us on race day, causing death and destruction elsewhere in Europe. It was overcast-to-partly-cloudy and breezy, and we did get hit with a wee random rain shower in the latter portion of the course, but otherwise it was great weather for a marathon. We asked a fellow racer to take our picture. There was a bit of fear behind that smile of mine. Could I really do this crazy thing? It was interesting people watching as we waited. There were plenty of people to watch! Forseriously? 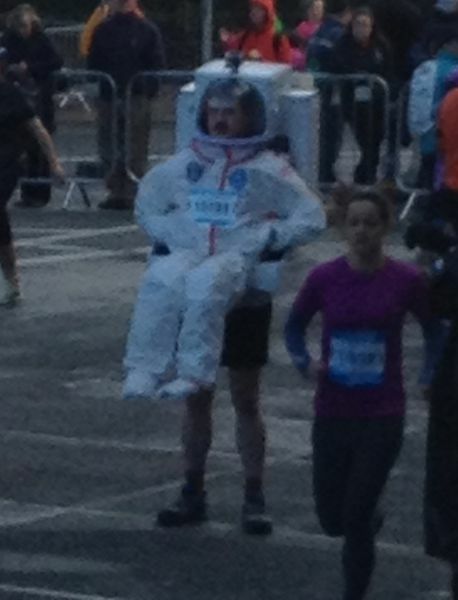 You are going to RUN A MARATHON in that getup??? There were loudspeakers up and down the street, but the announcer’s voice echoed so much off the flat facades of the Georgian buildings, I couldn’t understand what was being said. I’m sure the folks in nearby apartments trying to sleep in on their bank holiday weren’t too pleased. At some point, there was music. I assume it was the Irish national anthem. I vaguely heard the starts of the wheelchair racers and the orange wave. It must have been when the green wave took off that there was a stir in the blue wave crowd, and everyone began to move forward. I could see the backpack flags for the 5-hour-finisher pacers, and I angled to line up behind them. “Hm,” I thought, “I wonder if I can do a 5-hour marathon.” It requires an average 11:27 pace, and I had run my last 12-miler at close to that pace . . . The crowd moved forward again, towards the start line, and a bunch of people pushed ahead of us, so we were nearly the last ones lined up. It took us about 3 minutes to reach the start line. When we were finally running on the course, I was THOROUGHLY annoyed. There were scads of people WALKING, some of them 4-5 across. Argh!! 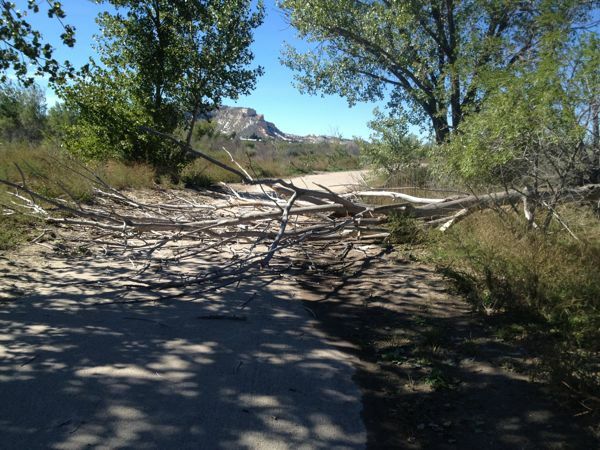 I probably added an extra mile to my run with all the dodging around I had to do. I wish there had been some pacer flags that said WALKER so the walkers could line up in the back, assuming they would have a clue and the common courtesy to do so. Here was a random race course picture, about 20 minutes into the race. I did not take very many pictures on the course, though I now wish I had taken more. Oh, by the way – those white street light toppers? I loved them. Shamrocks on them and everything. Wanted to get a good picture of one, but I never did. 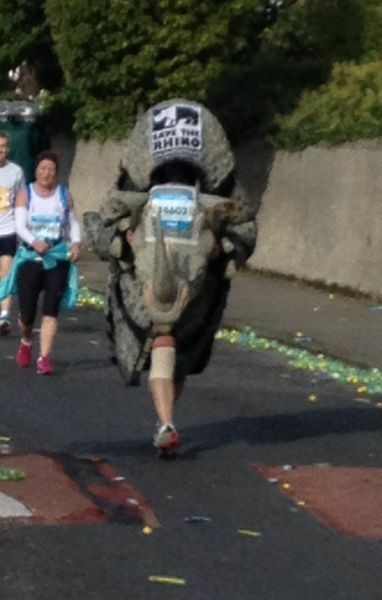 I spotted the rhinoceros guy up ahead of me and was determined to catch up so I could get a photo. Alas, I lost him while dodging walkers. Also had to dodge around a guy pedaling a massive 3-wheeled bike and blasting music from a radio. Who let that guy onto the course? 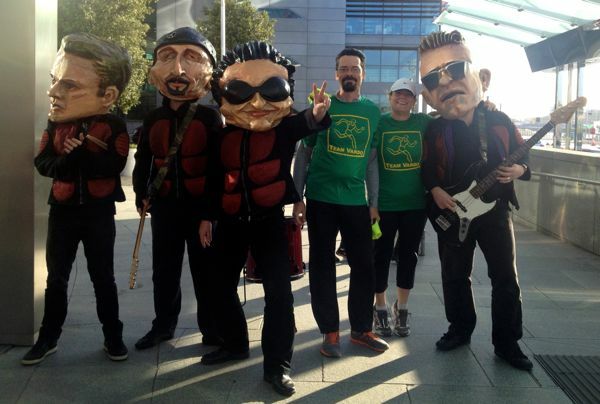 30 minutes into the marathon, I appreciated the thought of “Paddy Power.” Da-da-da-DA-da-DAAAA! Paddy Power!!! I later learned this was on online gambling establishment. Oh well. Worked for me as a “power up” whenever I saw one. 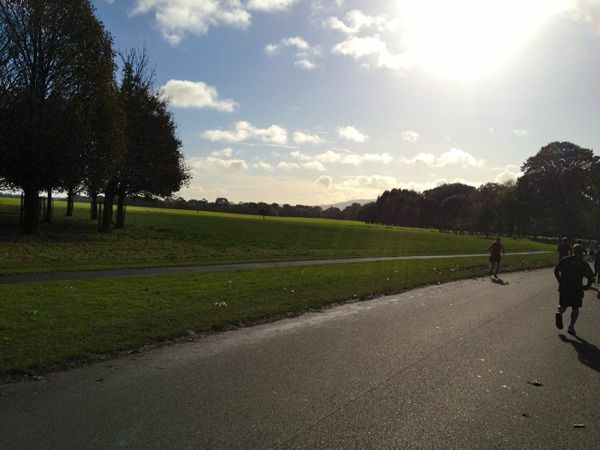 The run through Phoenix Park was lovely – the trees, the expanses of green grass perfect for kite flying. It was helpful to have some internal music at this point, somewhere between miles 4-8, since on the gentle hills in the park my left knee started complaining, and I started to get worried. I stopped to massage my I-T band a little, and the pain eventually went away. Huzzah! Only to have Bugman’s foot start bothering him a few miles later. Boo! But that pain seems to work itself out eventually, too. Huzzah! I also started to feel kind of sick to my stomach around this time. Something about the oatmeal and tea wasn’t working. Boo! 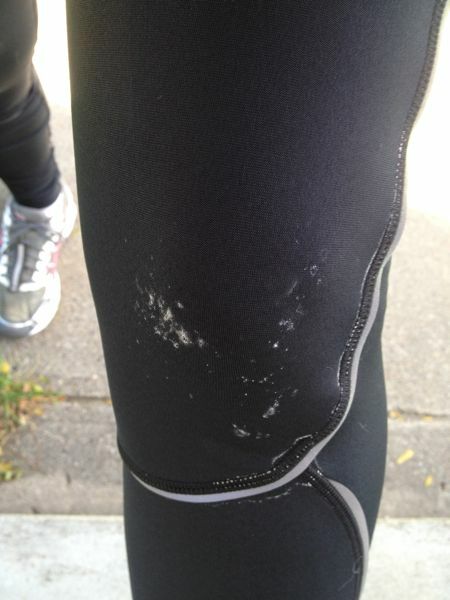 I tried a chocolate gel at the mile 6 aid station, and it actually seemed to settle my stomach. Huzzah! Next picture I took was at the halfway point, 2 hours and 35 minutes in. 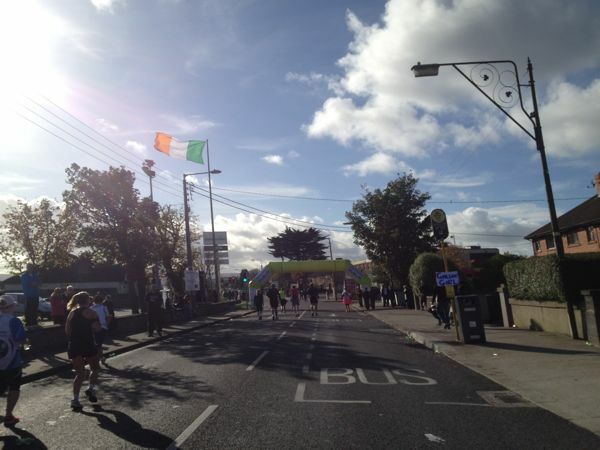 Note the Irish flag flying straight out in the wind. Also note the shamrocks on the light pole. I knew at this point there was no way I was going to make an under-5-hour marathon. Music stations. A good rhythm always helps motivate me and keep my feet moving. Although, as we passed through one station, they were playing Michael Jackson’s “Bille Jean.” Um . . . not something I would have chosen as motivational music . . . The spectators. You could pretty much guarantee that at any turn of the course, the intersection would be packed with spectators. As a slower runner, I really, really appreciated those spectators who stayed out on the course for hours and didn’t give up and head home after the first waves went by. Our names were printed on our race bibs, and it was awfully fun to hear my name called out in an Irish accent: “Well done, KAY-ti.” There were also tons of people offering candy to the runners, particularly towards the later stage of the marathon. And there was one guy offering Vaseline somewhere around mile 18 to relieve runners suffering from chafing issues. I took him up on a dab – not for chafing, but for my chapped lips. Aaah! Much better! The kids. The little tykes made the best cheerleaders. They were unabashedly enthusiastic, excited to have encouragement to yell at the top of their lungs for once. Lots of high-fives offered. A particular favorite were the kiddos on a tree-canopied residential street offering “good luck” leaves to the runners. Past the halfway point, all the faster runners were long gone ahead of us, and we were in a sea of fellow resolutes. We were constantly passing each other as we alternately ran and took walk breaks. It might have been before the halfway point, actually, that I noticed the first dropout: a limping woman, supported on the shoulders of friends, wailing that she would not be able to finish. I felt really bad for her, but quickly put her out of my mind. I did not want to think about that possibility. Yep. These folks know what it’s all about! This photo was taken shortly after noon, shortly after we passed the halfway point. Definite props to the volunteers who cleaned up after us! It was a different experience to receive bottles of water and sports drink instead of paper cups. I loved that I could hang on to the bottle and use the squirt cap to hydrate as needed. But there were some issues with this. The amount of liquid in those bottles was such that you couldn’t drink the whole thing at the aid station, so people either tossed the partially-consumed bottle near the aid station or carried them a ways and pitched the empties all along the course. 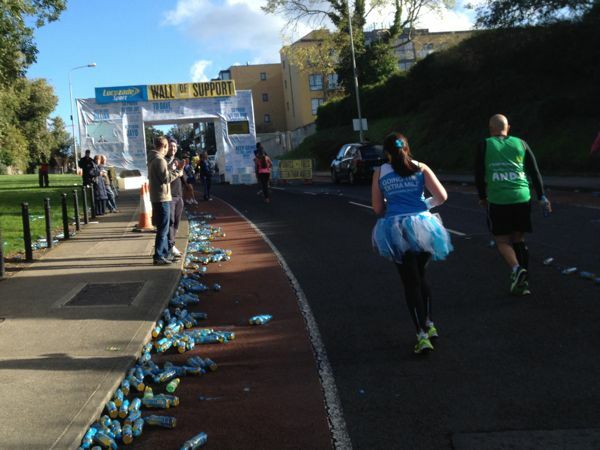 By the time Bugman and I were coming along the course, there were piles of bottles everywhere, which sometimes rolled onto the course and created a trip hazard. 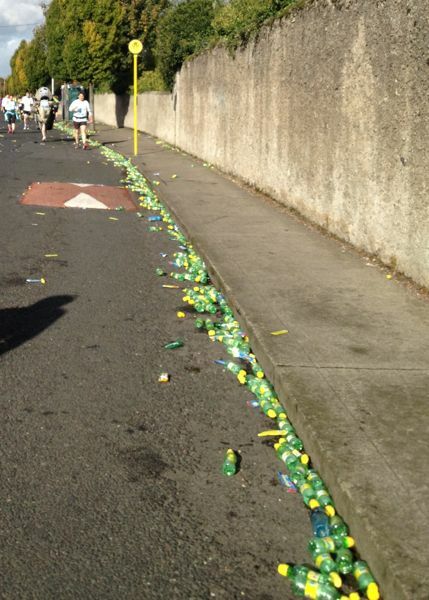 Some people tore off the yellow bottle tops, and I nearly twisted my ankle stepping on one. And the later-in-the-race stations with sports drink? Hooboy. Those bottles leaked everywhere and got popped by vehicles running over them, and the ground got so sticky (think of the nastiest movie theater floor you’ve ever experienced), I swear the effort to unstick myself from the ground with each step must have added minutes to my race time. At a point on the course when I really wanted to walk (around mile 15? ), I caught sight of the rhinoceros guy up ahead. He kept me going. Thanks, rhinoceros guy! We passed him at the aid station. He had to take his rhino head off to take a drink. There was a guy on the course wearing a t-shirt that said on the back something like “I am a runner. Running is fun.” At that point, the statement made us laugh. Running FUN? Hahahaha! I apologize for the blurriness of this picture, though it might, in fact, represent how I was seeing the world at the time My phone had been in Bugman’s back vest pocket, and he sweated on it and made my lens all blurry. 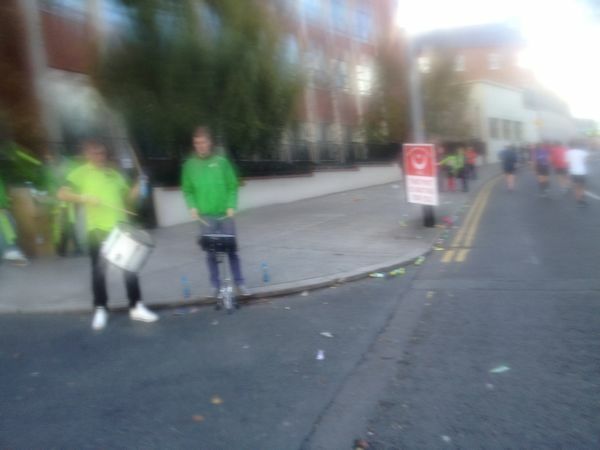 Anyway, what I was trying to get a picture of was the couple of guys with drums (Really helped heading up that hill! Thanks, guys!) and also the sign on the post, which I cannot now read, but which probably said something about beer. At mile 20, there was a “wall of support” to distract runners from the proverbial wall – a point in the race when many people run out of gas. You literally “ran through the wall.” There was some feature where supporters could leave you messages, but I didn’t quite get it. All I remember is, the ground was sticky from sports drink, and the music at the wall was so loud, I had to plug my ears as I ran past. I think it was a Guns n’ Roses song at the time. But at least it distracted me from the hill. 4 hours and 2 minutes in, 6.2 miles to go! 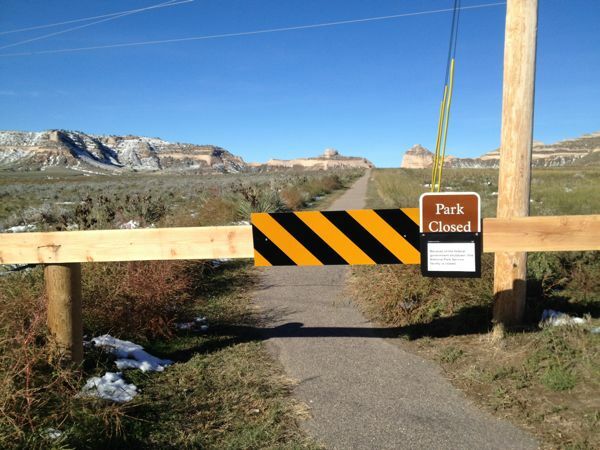 Somewhere around mile 22, my fatigue and the increasing pain in my legs overwhelmed me. I started to cry, which make my airway constrict, and I wound up walking and wheezing, trying to focus away from the emotion and the discomfort. I had never experienced attempting to keep running for so long. I had not anticipated what it would feel like to have the typical muscle and tendon achy-paininess compounded by the sore stiffness caused by being on my feet for so many hours. It was most unpleasant. I finally realized what I needed to do to be able to finish the race: find ways to distract myself from the pain. It certainly did not help that, at that point on the course, we happened to be passing through a quiet (boring) residential neighborhood. “Where’s a squirrel when you need one?” I joked. I fought back the tears for the remainder of the race, constantly casting around for something to latch my mind onto. Yeah – I realize I got the lyrics a little wrong, but the imagery about rubber, springs, and bouncing helped my pace, I’m sure! Those last couple of miles seemed so long! I often closed my eyes to try to block out my stupid tears. 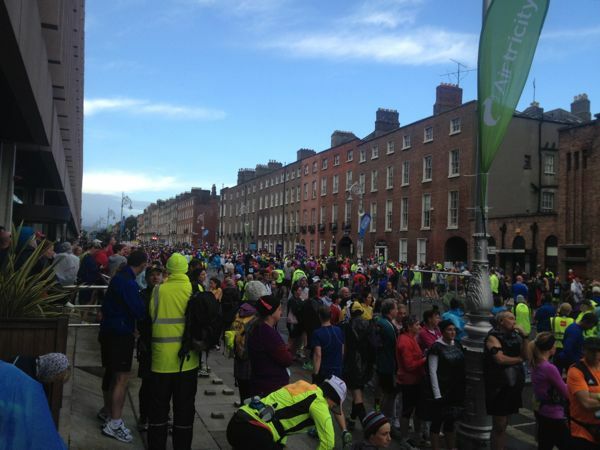 Totally embarrassing to be crying in front of all those people packed along the course in the heart of downtown Dublin. 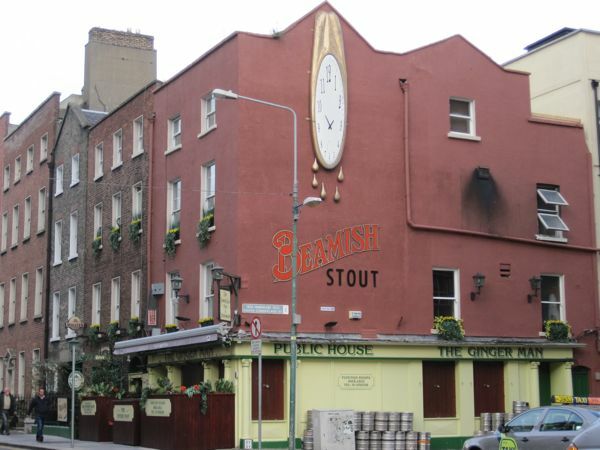 I happened to notice a corner pub that had a melting clock on the upper portion of the building. The pub said something about microbrews, so I started focusing on the idea of a post-race beer. Maybe a microbrew instead of a Guinness? But the pain kept interfering with my visions of a convivial pint. While we never got to visit the pub, it did make for an interesting story. The day after the race, we tried unsuccessfully to find the place. I approached a tourist information booth to see if the gent could help us. I didn’t realize how comically crazy that sounded until I heard my words repeated back as the tourism guy called a buddy to try to answer our question. So glad we found the place while retracing the marathon route later, or I’d have thought I’d been hallucinating! There it is! The Ginger Man, at the corner of Fenian and South Cumberland. 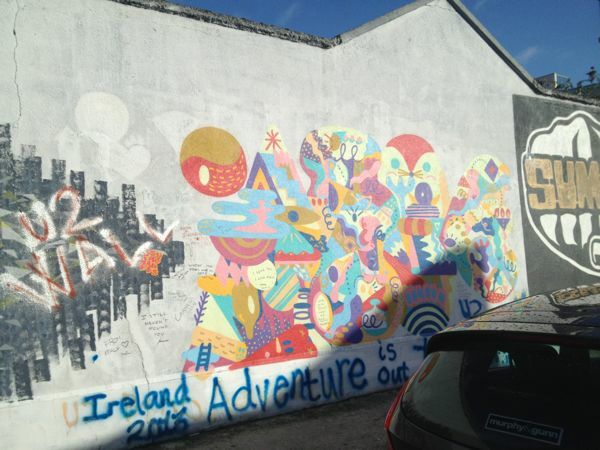 If I make it back to Dublin, I must go here! Back to the marathon . . .
At some point, I completely tuned out, lasering my attention on the road ahead. Only the road. Just the road. Keep moving. Finish in sight. Keep moving. The road ahead. I suddenly became aware of Bugman’s hand in front of me. The road ahead. Only the road. Just the road. Keep moving. Bugman had the wherewithal to take a picture at the approach to the finish. I’m glad he did, as I was totally unaware of what it looked like. 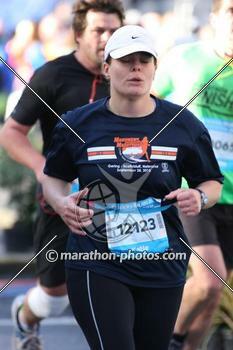 My finish photos are not ones of joyous celebration. But I finished!!! Chip time 5 hours, 25 minutes, 3 seconds. 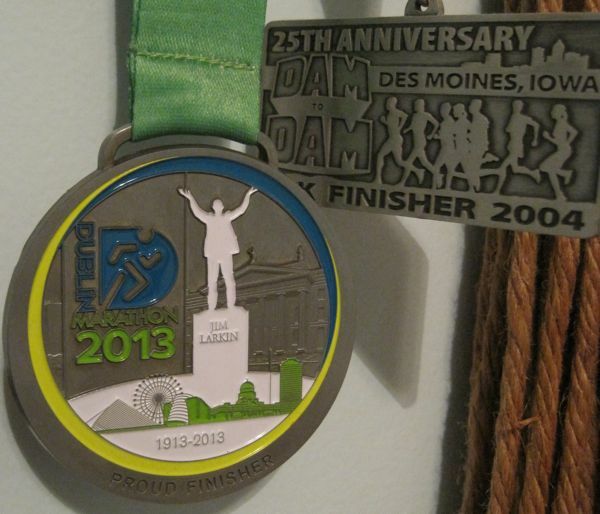 We hobbled through the finish chute and had our finisher medals placed around our necks. Major disappointment with the race shirts. They’d run out of all sizes smaller than a men’s large. What?? I recall having entered my race shirt size preference at registration. This was not an inaugural race. How could they run out??? Did they allow a bunch of late registrants? Did the earlier runners decide to choose smaller shirts than what they had registered for? Did they not expect so many people to finish? If it were a cotton shirt, I would probably still wear it, but it’s a long-sleeved technical tee – not comfortable for daily wear, and a major chafe risk on a run with that extra material flapping around. If I tacked it down at wrists and waist, I might be able to impersonate a flying squirrel. 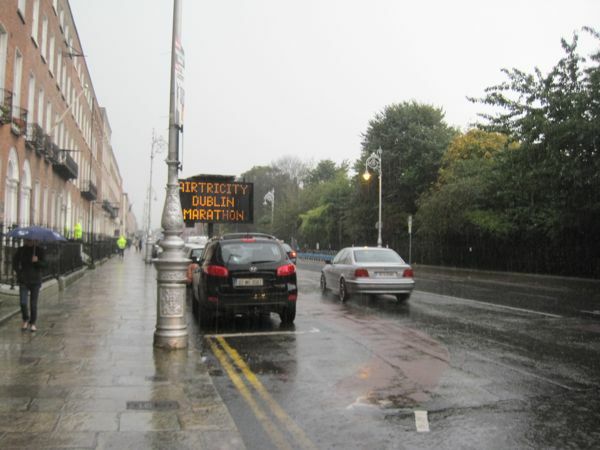 I know I was not the only one disappointed, as I heard several runners complain about it as we encountered them on tours and at tourist attractions around the city. At least I was only one size off. I bet there were smaller runners than me who got stuck with extra-large shirts. At least Bugman’s shirt fit him properly. At 6 foot 3, that’s not always the case for him. And maybe I can still wear my shirt on a cold day if I layer it on top of a cotton t-shirt. Oh well. We collected our goody bags – which I recall contained a bottle of water, a bottle of sports drink, a mini pack of Oreos, and a pack of jelly beans – and slowly hobbled around the block to retrieve our gear bags, occasionally stopping to lean against a fence or light pole to stretch. If there was any post-race food or celebration, I totally missed it. 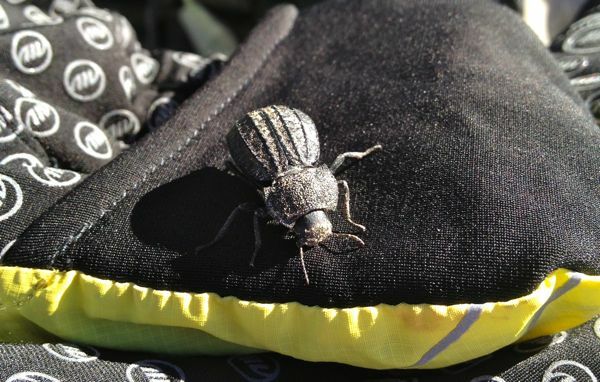 I was so glad to put on my puffy down vest from my gear bag. I was getting pretty cold. Bugman had a zippered hoody he bought at the expo. We hobbled back to the hotel, and I congratulated ourselves on booking first-floor accommodation. No steps! While Bugman showered, I lay on the bed and stuck my legs up in the air and gently stretched them. After about 10-15 minutes I felt considerably better. 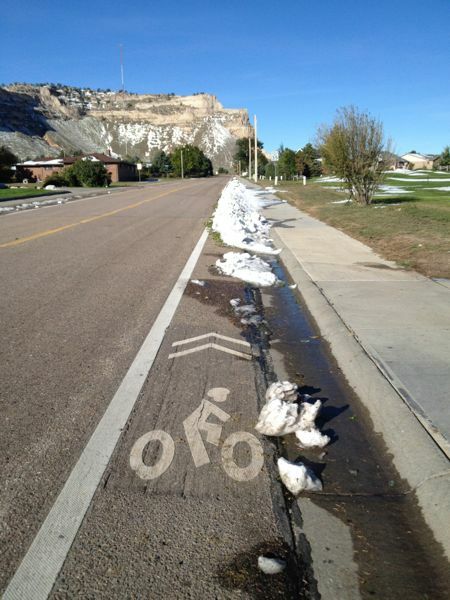 I think I had accumulated fluid in my legs that just compounded the pain. 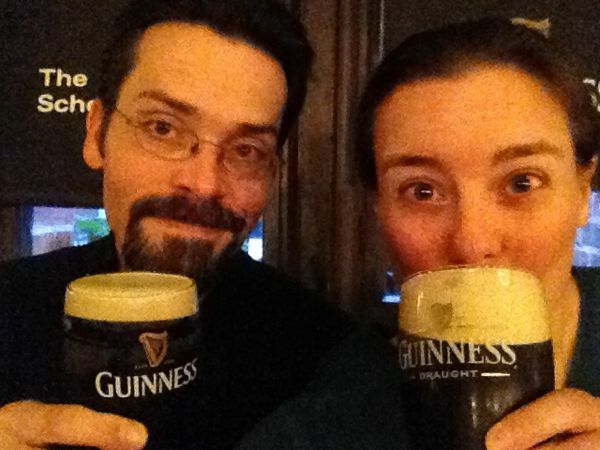 Once we were both cleaned up, we hobbled over to the hotel bar and ordered a couple of Guinnesses and some food. Hooray for having a pub directly attached to the hotel!!! Never did a beer taste so good! I had to keep reminding myself that only about 1% of the American populace will ever run a marathon, so I was way ahead of all the folks on the couch. And I did finish. And I lived. I had kind of joked about being able to survive the marathon, but for some, it’s no joking matter. People die while attempting marathons. A young man running his first marathon, just 27 years old, collapsed at the finish of the Dublin marathon and died the next day. I extend sympathies to his family. It’s so awful to have such a day of accomplishment turn tragic. I think a lot of runners, myself included, tend to focus on our own running experiences, but there are so many other people out there, each running their own races. 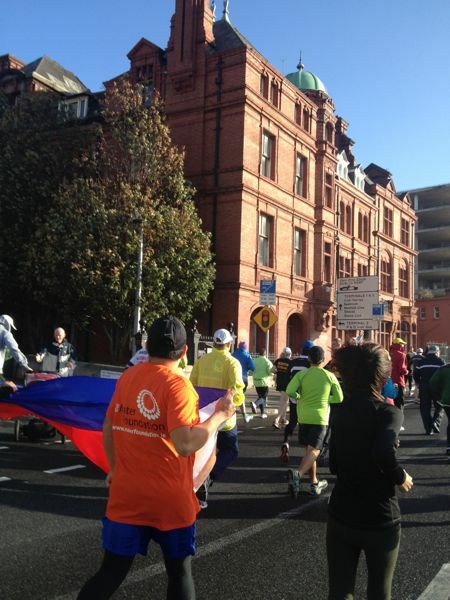 I was not the only runner, not the only American, not even not the only American running her first marathon in Dublin. 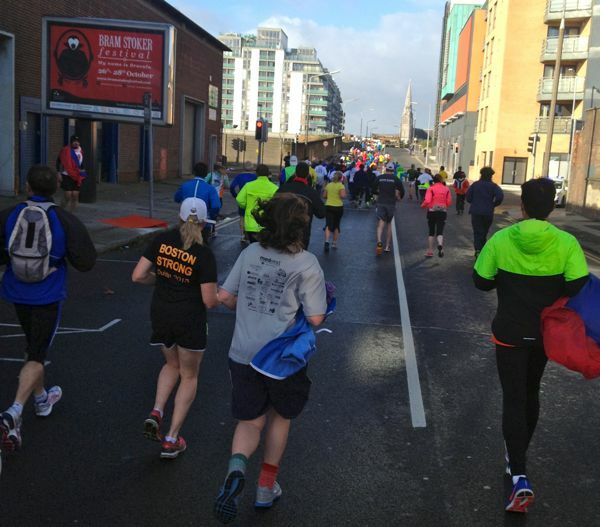 There was probably another American runner out there running her first marathon in Dublin to celebrate her 40th birthday! 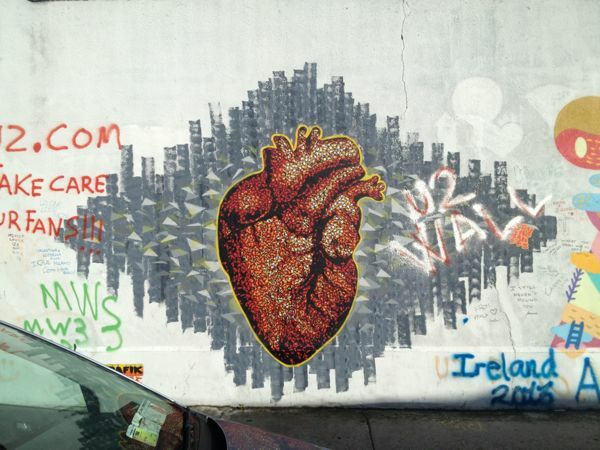 Anyway, I have been enjoying reading other people’s blogs about the Dublin marathon, and I’ll continue to update as I find more. I remember seeing her in the start area! I admired her sparkly pony tails. And I overheard Anders telling her about his recent race. I remember some of the areas in the race photos, too: the balloons tied to the gate at a turn, the kid in the stroller with the “worst parade ever” sign. 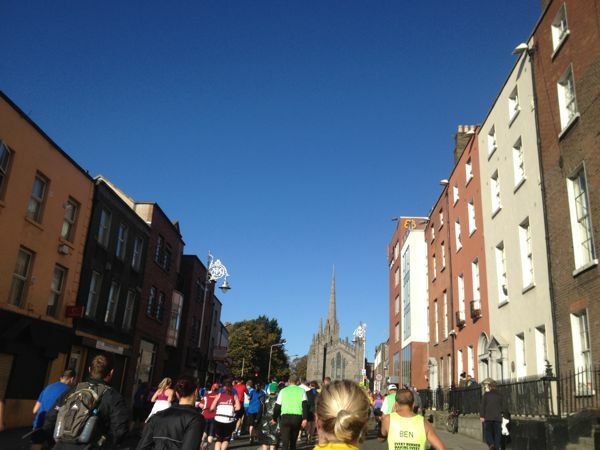 sjpc14 The Dublin Marathon 2013 – Completed! 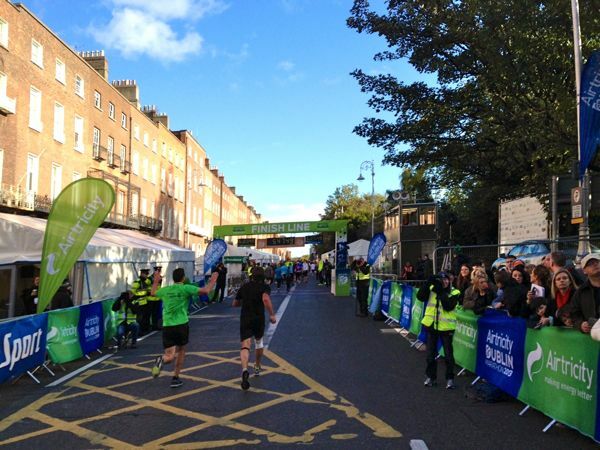 Run and Jump Dublin Marathon 2013 – finished! And there are blogs from media outlets and spectators, too! Ouch!! My back hurts!! The Joy! 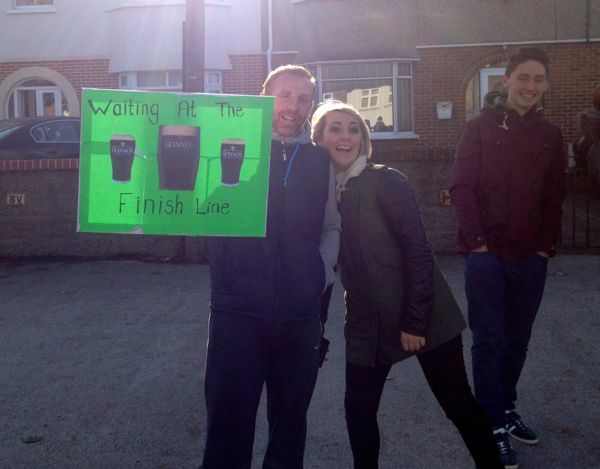 Dublin Marathon 2013. 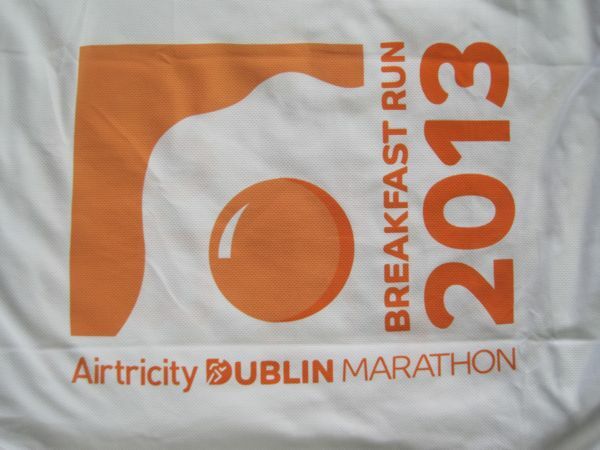 The International Breakfast Run the Sunday morning before the Dublin Marathon was a fun experience. Note: the enroute pictures won’t be all that great, as they were taken with my cell phone camera while I was in motion. 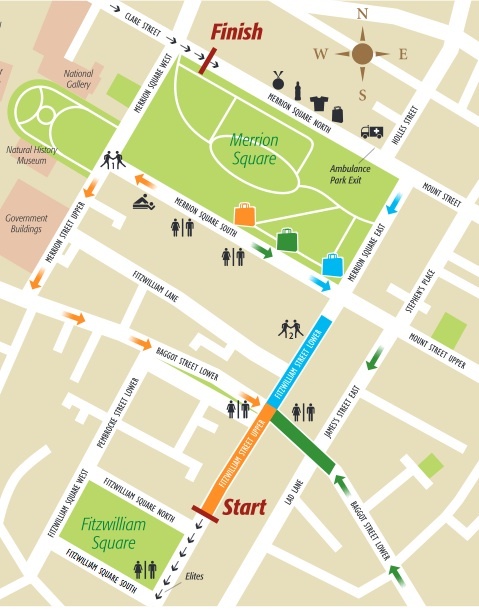 Here’s the route map of the 2013 run from the race program. 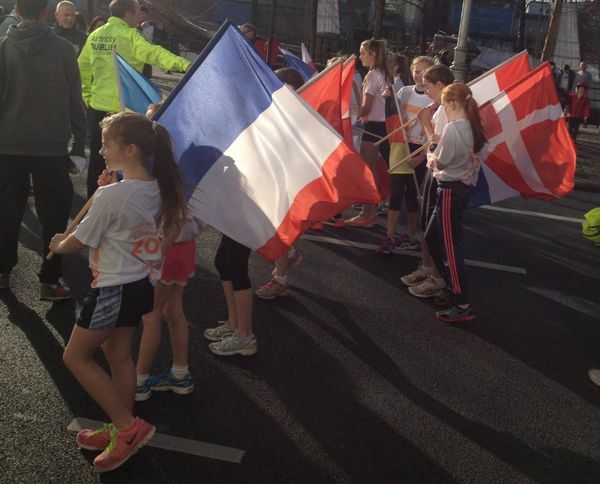 At the head of the pack were kids with international flags. It was pretty windy, so those kiddos had a challenge keeping hold of the flags at times. Behind them in this photo (not really visible) is the replica Jeanie Johnston “famine ship” – the only one to have had a zero mortality rate whilst transporting to North America the people fleeing the mid-1800s potato famine. 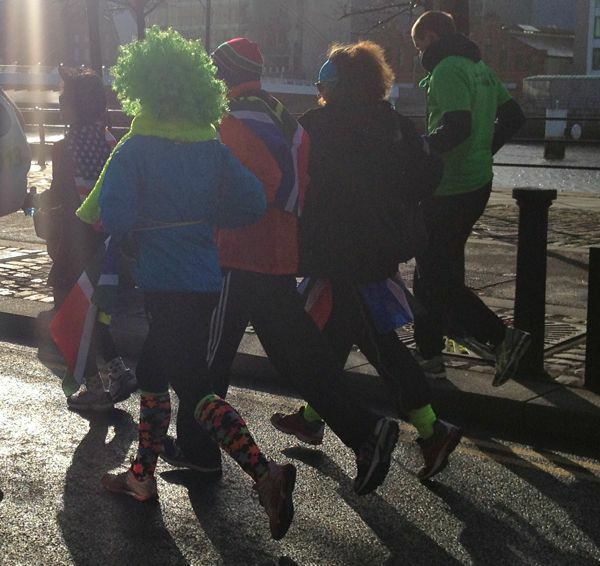 There were lots of runners in funny, colorful, or patriotic getups. This photo includes a couple of colorful South Africans and an American with Halloween devil horns and tail (American devil, eh?). I was passed by a runner carrying the flag of the Philippines, and just behind me someone called out “Philippino invasion!” I was then passed by two runners carrying a Philippine flag between them. 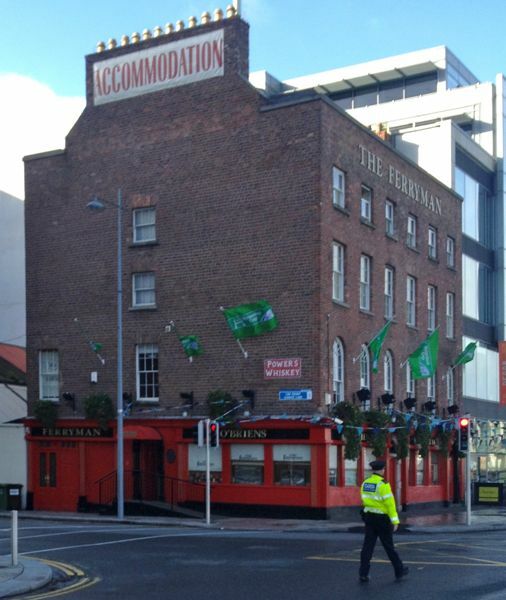 We passed the 1880s London and North Western Hotel building on North Wall Quay. 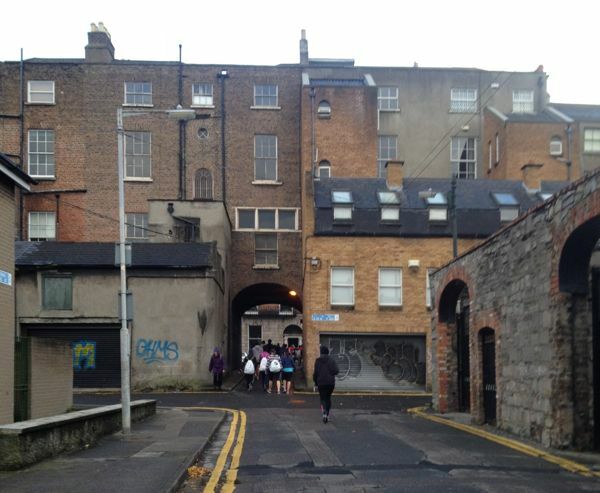 Westbound on Upper Sheriff Street, with St. Laurence O’Toole’s Church in the distance. At left is a billboard for the Bram Stoker Festival, of which we partook the previous evening with readings from “Dracula” in St. Patrick’s Cathedral. 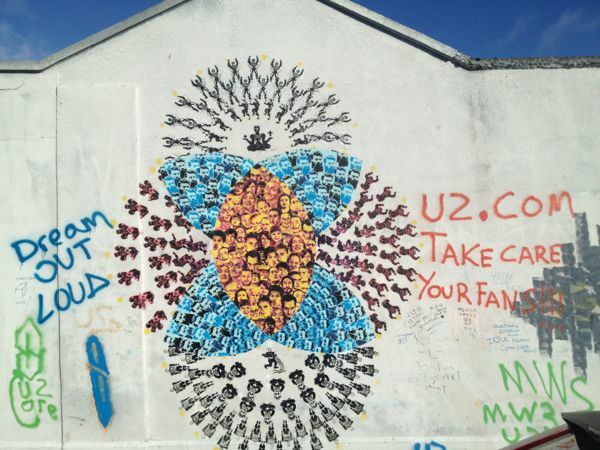 Here comes my favorite part of the run, on Hanover Quay, on the block containing U2’s former recording studio, all done up with (mostly) artful graffiti. 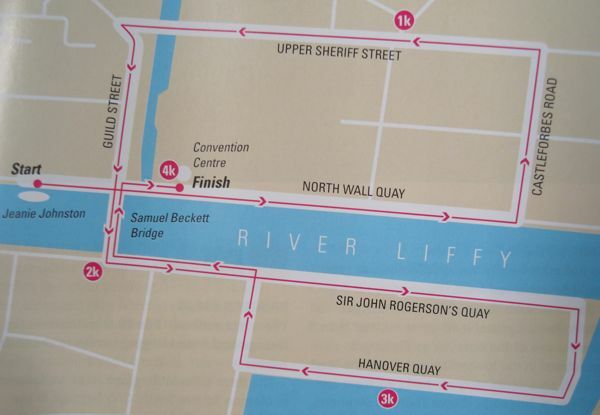 Westbound on Sir John Rogerson’s Quay: view of the Samuel Beckett bridge over the River Liffy. 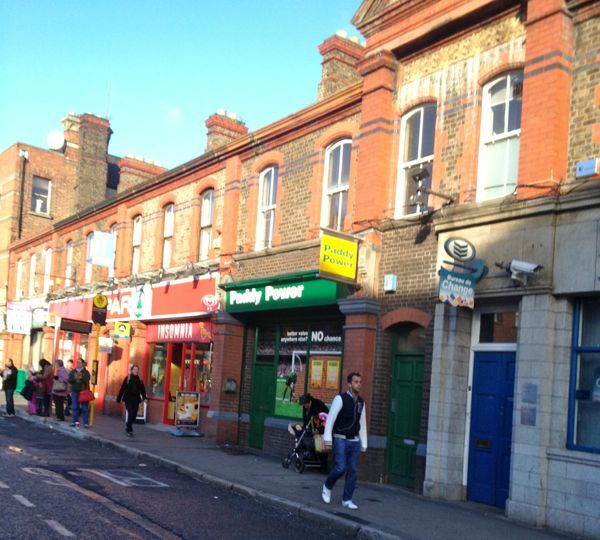 Many thanks to the Gardaí and volunteers who kept our breakfast run safe from traffic interference! 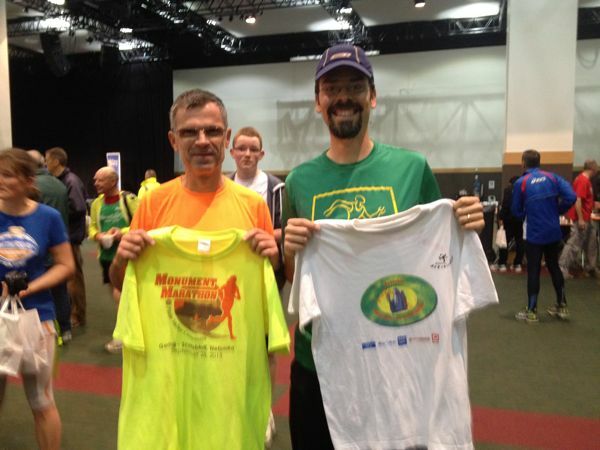 As we sat on the floor and ate our bagged breakfast while listening to live Irish traditional music, we had our Monument Marathon t-shirts laid out, ready for exchange. A Frenchman traded for Bugman’s shirt. While the Irish dancers were clogging about onstage later, I wandered around seeking a non-US exchange partner. I was unsuccessful in that regard, but wound up getting a technical t-shirt from a 5K in Rhode Island, which is kind of like a foreign country to a Nebraskan. Lastly, a couple of notes on things that could be improved. A-number one suggestion: get more information out there. There is nary a detail about the event on the official marathon site. 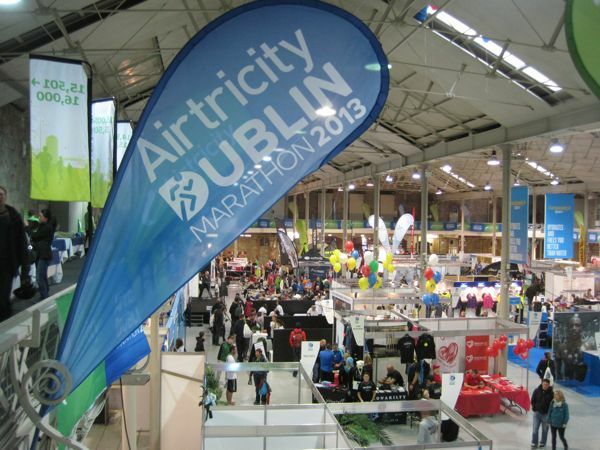 I happened to learn about the breakfast run informally through web searches, and confirmed the 2013 time and date by posting a question on the Dublin Marathon Facebook page. (There was a nice, prompt response on the FB question.) I’d wanted the information well ahead of time, to plan our limited time in country. I’d hoped there would be more information in our packets at the race expo, and there was a map of the course, start/end locations, and start time listed in the race program in our race packet. However, that information indicated only that the race would start at the Jennie Johnston, not that everyone would be meeting at the Convention Center ahead of the start. It would have been nice to know that, and to know ahead of time that there would be toilets as well as a gear drop available at the CC. Had I known about the gear drop, I would have brought a change of clothes for the chilly walk home, and I would not have run with my trade t-shirt clenched in my hand. And I bet others would not have traded their smelly t-shirts right off their backs. (Ew.) Or maybe they were trading the shirts off their backs because they didn’t know about the trade and had not brought an extra shirt. Another plus would have been a “t-shirt swap area” sign, or some timing on when the swap was to begin. I know the organizers don’t want to have anything to do with the exchange, as it’s a “between runners” kind of thing, but a little organization would help. As it was, people wanting to trade just kind of wandered around holding their shirts in front of them, ignoring the music and dancing. One Canadian had brought several shirts to trade, and laid them all out on the floor – a good strategy for getting noticed. A note: the most sought-after shirts seemed to be those from a country not your own (the more exotic-seeming, the better), with strong graphics, preferably made of technical material instead of cotton, and in like-new condition. After the breakfast run, we didn’t do much sightseeing, preferring to rest up for the race the next day. We bought pastries and sandwich fixings, kicked back in our hotel room, and watched a couple of movies. I’m glad for the stretch of the legs the breakfast run provided, and also glad for the tour of the dockland area, which I otherwise would not have seen much of. If I had to do it over again, I probably would dress a little crazier, and also have some kind of identifier of my home country.